I was intrigued by a recent article analyzing the diminishing preponderance of street protests in the United States, despite so-called “populist rage” at the current economic situation. The author, sociologist Sudhir Venkatesh, argues that for a variety of reasons – technological change, suburban sprawl and above all, personal debt – social protest isn’t as easy or as desirable as it was even 15 years ago. The net result, he claims, is a sort of street-level version of Robert Putnam’s famous “bowling alone” argument: yet one more indicator of the decline of civic engagement in American life. I live in London where anti-capitalist riots in anticipation of the G-20 Summit resulted in one death and some 80 arrests yesterday. Images like this one have been all over the news here. It’s true that the ring leader of this current wave of protests is a very charismatic 60 year-old, Chris Knight, (suggesting you’re never too old to burn someone in effigy.) But just eye-balling the coverage of these protests, most of the protesters look to be quite young. What do you think? Do you still take to the streets to protest anything? And if not, why not? Speaking of protest: Further to my earlier post on breast cancer screening, a group of doctors and patients has written a letter to the Times of London decrying the alleged over-estimation of screening benefits and under-estimation of perverse health effects that can derive from early mammograms. The letter has prompted National Health Service officials in Britain to re-word their pamphlets on said topic. Stay tuned on this one…we all have a stake in figuring this out. 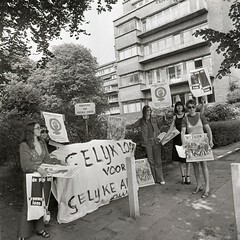 Image: Women Protesting for Equal Wages at the Ministry of Social Affairs (Netherlands) via Flickr under a Creative Commons license. Yes, Dels. I still protest. Not as often as I used to, but I do. I recently protested the Israeli bombing of Gaza, It was complicated. I was with a gaggle of Jews, so we made signs that said “Jews for Peace.” A lot of people stared at us. One side of the street was Israelis and Zionists. The other was mostly Palestinians and people of Arab descent. We were somewhere in the middle. The reason I don’t go to as many protests, is that I have become more cynical. I’m not sure what they accomplish. I protested the hell out of the war on Iraq. We all did here in NYC. It didn’t make a dent. When I was younger, I really believed in change on a large, macro level. I now feel my contribution to change is being made on the micro level–through the teaching I do, the art I make, my friendships, etc.